Country Restrictions: Belarus, Canada, Colombia, Estonia, Finland, Indonesia, Iran, Iraq, Israel, Kazakhstan, Mexico, Pakistan, Philippines, Puerto Rico, Syria, Virgin Islands (U.S.), Kentucky, Maryland, Missouri, New Jersey, New York or Washington. 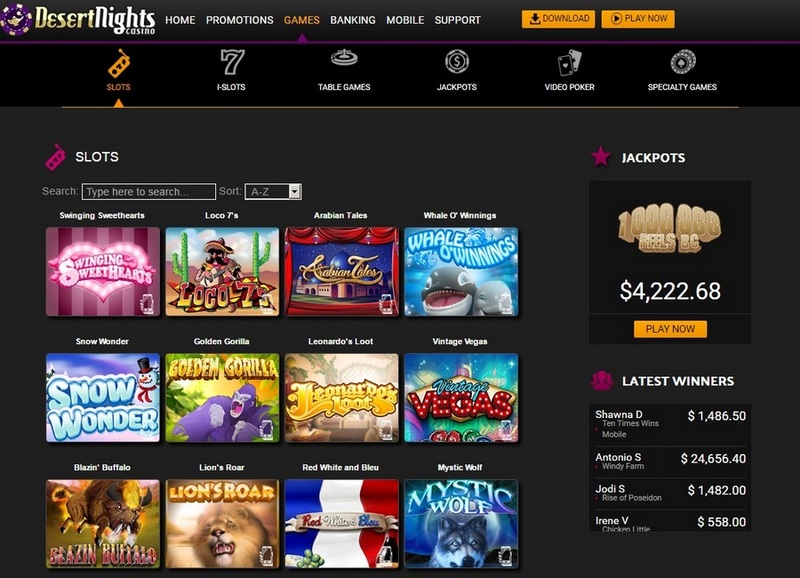 Desert Nights Casino is a place with a wide choice of hazardous entertainments and unusual deposit bonus programs. A bonus here is not just connected with the sum of money you input. It gives a choice from 8 options, with various sizes of a bonus and rules of playing. The general welcome sum of the prize for the beginner in here is $2250. Desert Nights were created in 2010 by the Deckmedia N.V Company, which already owns Slotocash Casino. Respectively, games & technical support can be expected at the level of Slotocash here. The platform works according to the license of the Netherlands Antilles, using the soft of the Real Time Gaming. Unfortunately, the website supports only English language. At the moment in Desert Nights Casino, there are more than 170 games. Among them, there are 130 gaming machines, 10 gambling pieces, 18 video pokers and 14 special attractions (kinds of roulette). Only 10 progressive jackpots on the resource. The most popular ones are roulette in the European style & Jackpot Cleopatra's Gold gaming machine. Video poker machines: Aces & pictures, Wild Two, Jacks or Better, Joker Poker. The cash out is limited to the sum of $2000 a week. The output of money on cash cards is impossible. 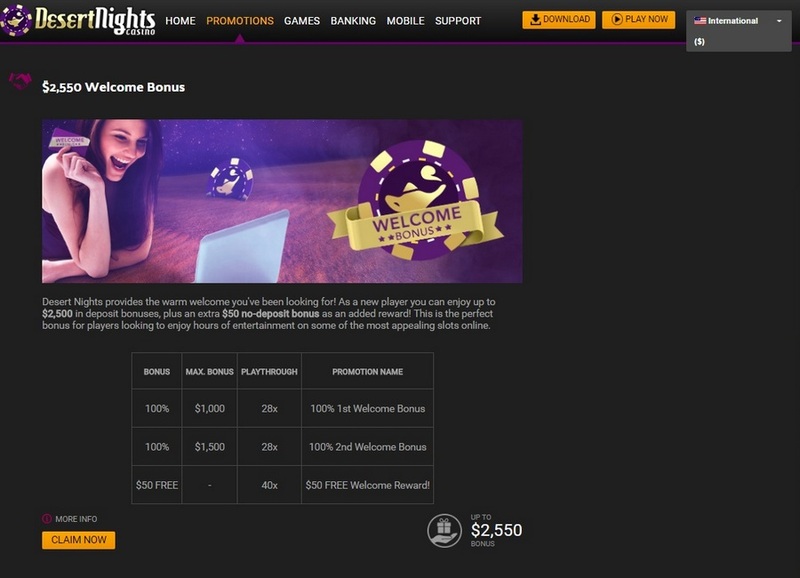 New player welcome bonus is the program of promotion of clients of Desert Nights Casino, which includes a no deposit cash bonus, invitation bonuses, and other offers both for new players and for regular customers. Before it, you will be offered to make the first deposit in Free Play game. You will have 30 minutes to win. In addition, you will get a first deposit bonus of $1000 and $1500 for the second deposit bonus. One of three statuses (bronze, silver or gold) granting the right for various advantages is given to regular customers of Desert Nights Casino (bonuses, the increased quantity of points of loyalty, monthly returns of a part of losses and so on). Bring the friend and you will be generously rewarded! There are a lot of bonuses. Besides, the player has an opportunity to choose what casino deposit bonus to use and on what deposit to put it on. For a game in the slot machine game, scratch cards and keno there are 6 bonuses, beginning with 121% (to $1210) and finishing with 200% (to $1958). If you don't like slots, you can take two bonuses for table games: 75% and 150% both to $450 max. The player receives all bonuses when he enters the codes of coupons specified on the website. Waygers are different. They vary from 22 to the 25-x sum of a bonus and the deposit. The size of a wayger depends on the received bonus. 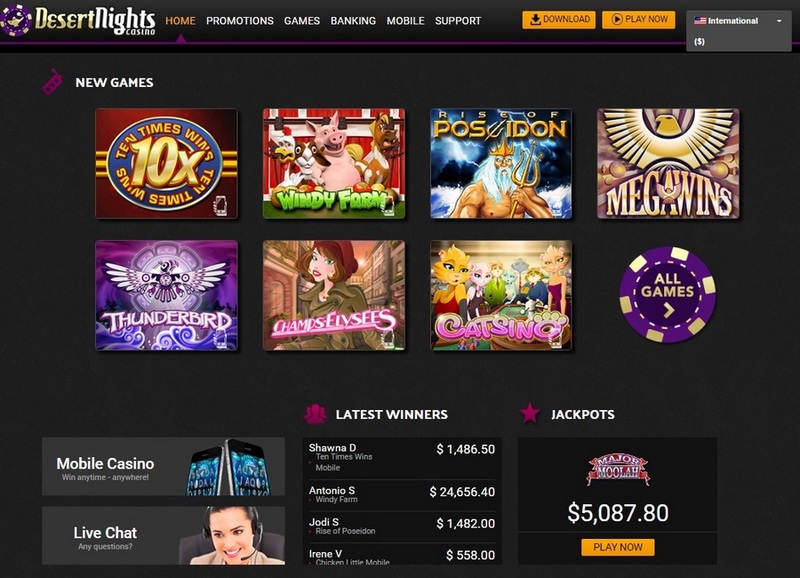 In Desert Nights Casino, it is possible to play with the help of downloaded version or in its flash version, opening directly in the browser. You can also download mobile apps. You can contact technical support in several ways: fax, e-mail, and contact phone. Pay attention: Canada, Israel, and Moldova have a restriction.